The 11th of January is Milk Day. The reason given for the choice of date, however, leaves much for desired. It’s never stated exactly where this occurred. It wasn’t in France, because by 1878 milk was already being delivered in bottles in France for some time. It wasn’t in the UK. In 1880, the Express Daily Company was the first company in the UK to produce and use milk bottles, followed by Wiltshire United Dairies (later to become Unigate.) They were delivered 4 times a day until 1894, when the advent of pasteurization enabled milk to last longer and deliveries to therefore be reduced to 1 time a day. The mostly likely candidate country is the US, because Americans are notorious for not thinking they ever need to specify a country. But the date doesn’t work for America, either. The first milk “bottle” in America (the Lester Milk Jar, whose lid was held in place as a screw cap), wasn’t patented until 29 January 1878 (18 days after the alleged first delivery), and no one is sure that it ever even actually saw use. 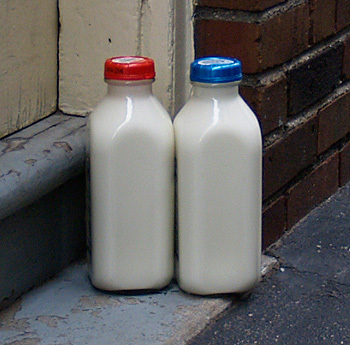 The first viable milk bottles were patented by the Warren Glass Company in 1880. Nevertheless, it’s clear [see the New York Times excerpt below] that bottled milk delivery was starting to happen in America by October 1878; and by 1880, was making enough headway for sellers of milk the old “milk can and dipper” way to be fighting back with dirty tricks. World Milk Day, as declared by the United Nation’s Food and Agricultural Organisation (FAO) in 2001, is 1 June. The FAO also declared, as of 2000, that World School Milk Day is 28th September. School Milk Week in the UK is the 2nd week of October each year. Harvard Milk Days are held in Harvard, Illinois on the first weekend in June. The festival started in 1942. From 1945 to 1983, they elected a Queen. Today, they choose instead a Dairy Princess. It is repeated in a great many places that this first delivery was done in New York City by either an Alexander Campbell or by the New York Dairy Company. Sadly, a search by CooksInfo.com of the New York Times from 1870 to 1880 didn’t turn up evidence of either name being involved in the dairy business in New York City at that time. “Difficulty of Selling Pure Milk: The mode of delivering milk in Paris, in sealed bottles, of standard quantity and quality, with the date marked upon the bottles is one familiar to traveled Americans, but one that has not been imitated here until very recently….” Credited to the New York Times. In Burlington Weekly Hawkeye. Burlington, Iowa. 19 October 1878. Page 7. I noticed in a recent issue of THE TIMES an article with reference to the supply of pure milk in cities, and referring to the method of delivering the same in sealed bottles. It is a subject in which I am much interested, as I am in this way serving families in New York with the milk produced on my farm, and, having considerable experience in the business, I would like to state briefly, for the benefit of your City readers, some serious obstacles to their being served with pure, fresh milk, which it is in their power to remove. Incredible though it may seem, I say what I know to be a fact when I assert that it is impossible to serve many of the best families in the City with pure milk, except at a loss to the farmer or the dealer who may deliver it. The source of the trouble lies in the almost universal corruption prevalent with the servants employed in these families, by which the farmer, in order to retain their custom, must submit to continuous exacting fees, which he cannot afford to do, but which the dishonest dealer can and is willing to do. A customer is secured for the farmer or honest dealer, as the case may be, and one or two quarts per day are delivered. Very frequently it is thought prudent not to dismiss the old milkman, and he continues to leave a quart or two. The servant soon presents the state of affairs to both parties, and signifies that for a consideration she will make it all right with the mistress, and have the other party dismissed. In the majority of well-to-do families, where the mistress does not attend to the details of the house-keeping, the servant is in a position to do all that she promises. The milk delivered by the party against whom she is prejudiced will be put in a warm place, where it will speedily sour, and sometimes even vinegar and dirt put in it, and she will swear that it was delivered so. Now, we thought when we decided to deliver the milk in sealed bottles put up on the farm, that we could guarantee to every customer milk as pure and clean as it is posslble to get from the cow, and so we can, if our customers will do their part, but so thoughtless and careless are they that we have nearly as much trouble as by the old method of delivery. The servants are allowed to break the seal and open the bottles. They drink the rich cream from the top of the bottle, or use it for their coffee, and fill up the bottle with water, or if an old milkman is at their elbow with his little present, with somethlng worse than water. The head of the house is disgusted, and exclaims: ” Why, this bottled milk is a perfect humbug.” The deliverer of it is not allowed to make a suggestion, but is spurned from the door, the old milkman resumes his place, with a fair percentage of water in the dipper, and if he makes his little presents with some degree of regularity all goes smoothly again, the good people up stairs being entirely ignorant of the game played below. In some cases where we have been permitted to suggest the source of the trouble with the milk, the mistress, while admitting that we might be correct, dare not request the servant to place the bottle of milk on the table unopened for fear of giving offense. What more can be expected of us in order to serve residents of the City with pure milk? There is no question but that milk put up and delivered in the manner alluded to by reliable farmers, will be found to be pure, sweet, and clean, much more so than by the old method of delivery. If the consumer will but insist upon having it put upon the table just as it is delivered at the door, and will see that it is kept in a cool place in warm weather.” — G.F. TABER. Ravinewood Farm, Wednesday April 21. “Can we have pure milk? By Permission of our servant girls we may”. New York: The New York Times. Monday, 26 April 1880. Page 3. Poulter, Sean. Doorstep Pintas May Be Broken By Brussels. London: Daily Mail. 31 July 2001.